Hello friends ! Today we are going to open a course for you. It may helpful for your career. This course name is Web Design. Nowadays this is the most interesting thing of the world. Form this site you can learn many web design language. For web design you need some language like, html, java, j-query, css etc. We will teach you all of these language very easily by this course. So stay with us to learn about web design. First of all you will shortly discuss about all the language. But remember that this course especially made for the beginners. If you know already something about web design then it will help you a lot. Now we will discuss about html. Html Is a Hyper Text Markup Language. This is the soul of computer language. You can not do anything without this language. Hyper Text Markup Language (HTML) is the standard markup language for creating web pages and web applications. With HTML you can create your own Web site. Web browsers receive HTML documents from a web server or from local storage and render them into multimedia web pages. HTML is a markup language that web browsers use to interpret and compose text, images, and other material into visual or audible web pages. This is enough to know about html. For web design you need some tools. Don’t worry we will tell you about those tools. You need some high configuration tools like Adobe Dreamweaver or Notepad ++, Mozilla Firefox or Google Chrome (Browser) and Abode Photoshop. If you have all these then you can start you course. You can get some idea about HTML form our HTML Code. Get some idea about html form the given link. After you get idea then we will start our lessons. We hope that you will like to learn this. 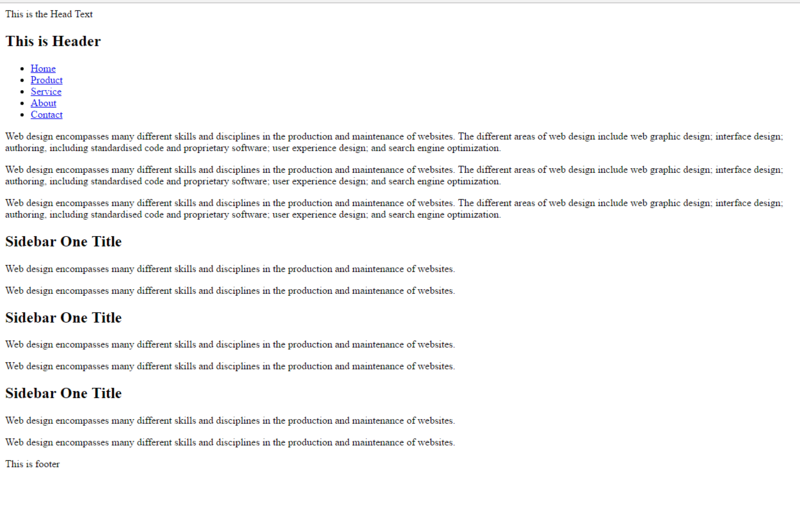 And you can get a batter salary by this web design. This is a fashion also. You can earn money by sitting your room. We will start our lessons from the next post. Till then be well and stay with us. All html tags has two part. One of them is Starting and the other is Ending. The starting tag is and the ending tag is . There is some tag who don’t have the ending tag like . After you write these codes you can see the bellow text on your browser. You can see there is another text This is the Head Text. This text stands into the starting and ending tags. Now you can understand very easily that the text what given into the head text will show on the browser. You can see the bellow picture to understand. So now we will talk about the best part of design is Body. It is the main thing of design. You will see the text or style what given to the body section. Now we will write some tags on body to show you how it looks…. including standardised code and proprietary software; user experience design; and search engine optimization. There is many tags like p, div, h2 and all of these has its own value. You need to know about the tags work. Otherwise you can not work with these. When you finished the codes you will see the bellow result. Now you have learn how to create a first look web page. By all of these tags you are able to create a web page. Hope you enjoyed it.